Europe and USA with over 60,000 scientists. Mashelkar served as the Director General of Council of Scientific and Industrial Research (CSIR), with thirtyeight laboratories and about 20,000 employees for over eleven years. He was also the President of Indian National Science Academy and President of Institution of Chemical Engineers (UK). 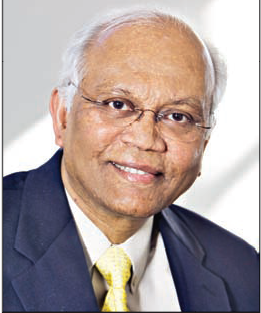 Dr. Mashelkar is on the Board of Directors of several reputed companies such as Reliance Industries Ltd., Tata Motors Ltd., Hindustan Unilever Ltd., GeneMedix Life Sciences Ltd., Indigene Pharmaceutifcals Ltd., ICICI Knowledge Park, Thermax Ltd., Piramal Life Sciences Ltd., and KPIT Cummins Infosystems Ltd. He is a member of the Scientific Advisory Board of the Microsoft. Dr. Mashelkar is only the third Indian engineer to have been elected (1998) as Fellow of Royal Society (FRS), London in the twentieth century. He was elected Foreign Associate of National Academy of Science (USA) in 2005, Associate Foreign Member, American Academy of Arts & Sciences (2011); Foreign Fellow of US National Academy of Engineering (2003); Fellow of Royal Academy of Engineering, U.K. (1996), Foreign Fellow of Australian Technological Science and Engineering Academy (2008) and Fellow of World Academy of Art & Science, USA (2000). In August 1997, Business India named Dr.Mashelkar as being among the 50 path-breakers in the post- Independent India. In 1998, Dr.Mashelkar won the JRD Tata Corporate Leadership Award, the first scientist to win it. In June, 1999, Business India did a cover story on Dr.Mashelkar as "CEO OF CSIR Inc.", a dream that he himself had articulated, when he took over as DG, CSIR in July 1995. On 16 November 2005, he received the Business Week (USA) award of ‘Stars of Asia’ at the hands of George Bush (Sr.), the former President of USA. He was the first Asian Scientist to receive it. Deeply connected with the innovation movement in India, Dr. Mashelkar is currently the Chairman of India’s National Innovation Foundation, Reliance Innovation Council, Thermax Innovation Council and Marico Innovation Foundation. Thirty universities have honoured him with honorary doctorates, which include Universities of London, Salford, Pretoria, Wisconsin and Delhi. The President of India honoured Dr.Mashelkar with Padmashri (1991), Padmabhushan (2000) and Padmavibhushan (2014), which are the highest civilian honours in recognition of his contribution to nation building. When Dr. Mashelkar took over as the Director General of CSIR, he enunciated “CSIR 2001: Vision & Strategy”. This was a bold attempt to draw out a corporate like R&D and business plan for a publicly funded R&D institution. This initiative has transformed CSIR into a user focused, performance driven and accountable organization. This process of transformation has been recently heralded as one of the ten most significant achievements of Indian Science and Technology in the twentieth century. Dr.Mashelkar has been propagating a culture of innovation and balanced intellectual property rights regime for over a decade. It was through his sustained and visionary campaign that growing awareness of Intellectual Property Rights (IPR) has dawned on Indian academics, researches and corporates. He spearheaded the successful challenge to the US patent on the use of turmeric for wound healing and also the patent on Basmati rice. These landmark cases have set up new paradigms in the protection of India's traditional knowledge base, besides leading to the setting up of India's first Traditional Knowledge Digital Library. In turn, at an international level, this has led to the initiation of the change of the International Patent Classification System to give traditional knowledge its rightful place. As Chairman of the Standing Committee on Information Technology of World Intellectual Property Organization (WIPO), as a member of the International Intellectual Property Rights Commission of UK Government and as Vice Chairman on Commission in Intellectual Property Rights, Innovation and Public Health (CIPIH) set up by World Health Organization (WHO), he brought new perspectives on the issue of IPR and the developing world concerns. In the post-liberalized India, Dr.Mashelkar has played a critical role in shaping India's S&T policies. He was a member of the Scientific Advisory Council to the Prime Minister and also of the Scientific Advisory Committee to the Cabinet set up by successive governments. He has chaired twelve high powered committees set up to look into diverse issues of higher education, national auto fuel policy, overhauling the Indian drug regulatory system, dealing with the menace of spurious drugs, reforming Indian agriculture research system, etc. He has been a much sought after consultant for restructuring the publicly funded R&D institutions around the world; his contributions in South Africa, Indonesia and Croatia have been particularly notable. Dr.Mashelkar has won over 70 awards and medals, which include S.S. Bhatnagar Prize (1982), Pandit Jawaharlal Nehru Technology Award (1991), G.D. Birla Scientific Research Award (1993), Material Scientist of Year Award (2000), IMC Juran Quality Medal (2002), HRD Excellence Award (2002), LalBahadurShastri National Award for Excellence in Public Administration and Management Sciences (2002), World Federation of Engineering Organizations (WFEO) Medal of Engineering Excellence by WFEO, Paris (2003), Lifetime Achievement Award by Indian Science Congress (2004), the Science medal by the Academy of Science for the Developing World (2005), AshutoshMookherjee Memorial Award by Indian Science Congress (2005), etc.